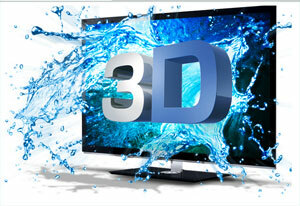 The WX800 Cinema Series is Toshiba's first foray into the world of 3D TVs. As such, it becomes the flagship model in Toshiba's lineup of HDTVs. When it comes to 2D performance, this 240Hz TV, with its lush picture quality, rightfully has earned its ascendancy. But as a fledgling 3D TV, the WX800 still exhibits some growing pains - as does the whole 3D industry. Before I enter into that third dimension, let's begin with the WX800's 2D foundation. The TV provides built-in Wi-Fi capability and an enticing group of streaming Internet content providers including Netflix, Vudu, YouTube and a whole host of Yahoo Widgets. And the 55WX800U that I reviewed is my new fave screen size, a view-filling 55". To take it all in, I was almost tempted to move my chair back, but the picture quality of 2D content kept pulling me closer. In contrast, I could never find a comfortable distance when watching 3D Blu-rays. I was always pacing back and forth hoping to find that sweet spot when those two images would merge into a glorious 3D picture. I'll discuss my 3D experience in more detail in the Performance section. For now, let's say that it literally paled when compared to the 55WX800U's lustrous 2D playback. If I were to judge the Toshiba 55WX800 only on its 2D picture quality, I would give it four stars. But alas, it is a 3D TV and it does not deliver the consistent 3D experience that would wow friends and family. 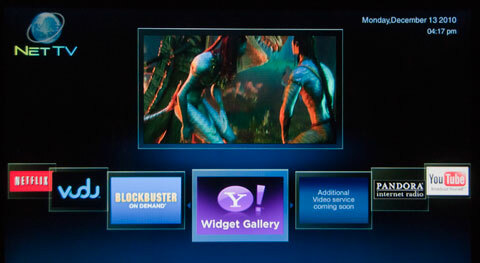 This 3D TV has Wi-Fi built-in and its list of Internet streaming providers is extensive. The 55WX800U is DLNA Certified, meaning that you can integrate it into your home network. And for the tweakers, the picture tuning tool chest is overflowing. Setting up the 55WX800U can be quick and painless, even the networking procedure. You can dial in a great looking 2D image with a few clicks on the remote. Attempting to achieve a satisfactory 3D picture can be more trying. 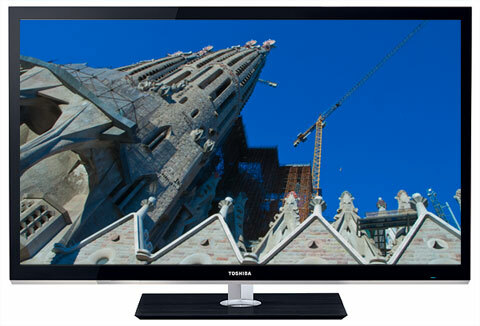 Toshiba lists the 55WX800U for $3299, which is comparable to other 55" edge-lit LED 3D TVs. I consider that altitude a little too high, especially for unspectacular 3D performance. But as I was going through my email today, I noticed that Amazon was offering this Toshiba at less than half that price, which even for this grizzled veteran is jaw dropping. It's rare to find a 2D edge-lit LED TV for that amount. And the 55WX800U is a very good 2D TV. In this price range, this Toshiba becomes a compelling value. Though not a featherweight, this 55" TV can be easily handled by two strong backs. The glass on the front runs edge to edge with a sliver of silver frame. Toshiba touts their CrystalCoat which "stops ambient room light reflections from washing out the picture." But the screen is still reflective, though not distracting when the TV is on. The TV does swivel on its stand about 30 degrees back and forth, which makes the setup more flexible for adjusting to different seating arrangements. On the front of the TV, along the right side of the bottom bezel, the operational controls can be activated by sliding your finger over them. On the right edge of the TV, a vertical connection panel is inset. It contains an SD Memory Card slot, which is not common on many TVs that I have seen. It offers a convenience to those who have digital cameras that record on SD cards. The two USB ports are where you can plug in USB devices to play JPEG photos, MPEG2 videos or MP3 songs. Next is the LAN port for those of you who decide to connect to your home network more traditionally. Moving down the line are one Composite video In (with matching stereo Audio Ins), one VGA video input for PCs (with a matching stereo minijack Audio In) and one HDMI input. Turning the corner at the bottom, a second connection panel runs horizontally with the plugs facing down. It starts with three more HDMI inputs. The first can be used for the ARC (Audio Return Channel) feature, which the manual states, "enables the audio signal of the TV to be sent to the AV amplifier via the HDMI cable." Next in line is the stereo audio input for the adjoining Component video (YPbPr) In. To conserve space, Toshiba provides an AV adapter cable and a Component adapter cable. Each have a multipurpose miniplug on one end (that attaches to the TV) and the more traditional RCA connectors on the other. Also on the panel, an SPDIF (optical) digital Audio Out is provided for sending audio to external speakers or a receiver. Next is a port for an IR blaster. The one RF antenna connector links to integrated NTSC/ATSC/QAM tuners. Since the tuner system is Clear QAM compatible, you can attach your cable TV signal directly into the RF connector and tune in unscrambled cable stations. With the ATSC tuner and the proper antenna, you also will be able to tune in digital signals broadcast over-the-air. If you are more interested in receiving your content streamed from the Internet, this Toshiba offers NetTV which is an aggregate of a number of popular streaming movie providers like Blockbuster, Vudu and Netflix, as well as the exponentially expanding video library from YouTube and Internet radio from Pandora. Under the aegis of Yahoo and its Widgets, 51 (at last count) more sources like CNBC and Flickr can be accessed. As more and more people begin to tap into these founts of content, I will once again recommend that if you are serious about obtaining good streaming video picture quality, you will need fast and robust bandwidth from your Internet provider, ideally around 10Mbps. Some sites suggest as low as 2.5Mbps, but if anyone else in your house is accessing the network, the video playback will deteriorate. At least try to have around 5Mbps. For the most consistent results, I would stick to a wired setup. But if you insist on going wireless, opt for an 802.11n router to feed your TV. This Toshiba also provides a Media Player feature that can access videos, photos and music stored on your computer or other DNLA compliant devices and play the content directly on to your HDTV. The slideshow interface is pretty basic, though it offers a good range of interval times (3, 5, 10, 15, 30, 60 and 90 seconds). You also can add music to the slideshow. There are no transition choices. Basically slides fade up and down from black. But you can adjust Picture Controls while in the Media Player. The big multi-function remote control is a handful, which I don't mind because there is plenty of room for big buttons with easy to read labels. When you press the Light button, the remote's backlight glows an eerie red. The layout is fairly standard though a couple of functions, like Mute and Menu share the same toggle switch, which isn't ideal for fat fingered fellows. I appreciate the direct access buttons to NetTV and Yahoo Widgets. I wish there was one to take me straight to the Media Player. Though the Quick button is an extremely handy item that will open up context sensitive menus with features like the Picture Controls and the Media Player. The manual takes you through all of the controls, but doesn't add much explanation or guidance for some of the more arcane interfaces like the Backlight Adjustment Pro. I guess it is one of those features that if you have to ask how, you shouldn't be fiddling with it. On May 1, 2010, the EPA implemented Version 4.1 of the ENERGY STAR Program Requirements for TVs. They are now publishing a list of TVs that that meet this stricter standard. (You can find it here.) The Toshiba 55WX800U is on the list, all 1276 square inches of screen area. The EPA states that this Toshiba's On Mode Power is 148W and Sleep Mode Consumption is .1W. Based on the formula that the TV is on five hours a day and in Standby for the other 19, the Estimated Annual Energy Use is 270.79 kWh/year. You need to check your electric bill to see how much you are paying for a kWh. The rate that I have been using in previous reviews is 10.4 cents. Doing the multiplication, at that rate, the yearly energy cost is $28.16. In 2011 we will begin to see manufacturers attaching those yellow ENERGY STAR tags that you find on air conditioners and refrigerators. Until then you will have to study the ENERGY STAR list to see how the 55WX800U compares to other 55" TVs. And remember, when you compare TVs of different sizes, screens that are even a few inches larger are quite a bit bigger in total area. 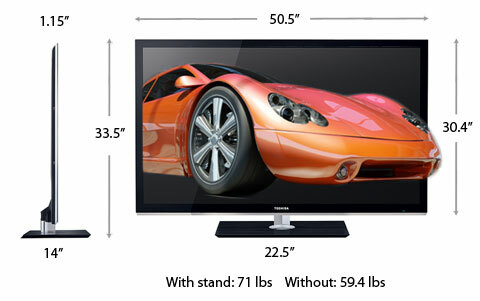 For example, the total area of a 55" TV is over 35% more than a 47". When you initially power up the 55WX800U, Toshiba presents you with a Quick Setup menu, where you enter the basics like Language and Time Zone and then scan for TV channels. Before I was even done with the Quick Setup, the TV had already sensed that I had attached an Ethernet cable and it had connected to my home network without any coaxing from me. I did have to tell my computer to allow the TV to share my files that were on my hard drive. And if you plan to partake in Netflix or other Internet streaming features, you will need to set up accounts with those providers. Plan to set aside part of an evening to work your way through the process and familiarize yourself with the possibilities. Now, about calibrating the TV, I think that I will continue the theme of Quick Setup and suggest that you simply punch the Menu button on the remote, open the Picture menu, and click on the first item, Picture Mode. You have seven default Picture modes: AutoView, Sports, Standard, Movie 1, Movie 2, Game, and PC. Start playing your favorite DVD or TV show and page through the modes to see if one strikes your fancy. In the spirit of simplicity, I say pick Movie 1 if you have subdued lighting. Choose Movie 2, if you prefer a little brighter image. If you want to leave the driving to Toshiba, you can choose AutoView and the gnome inside the TV "automatically adjusts picture settings based on ambient light conditions and input signal content." Unless you are particularly persnickety, you should be ready to sit back and enjoy your TV. If you really feel the urge to delve into finer tuning, the 55WX800U offers a full range of calibration tools - so extensive, that you can easily get lost in the maze. I would advise that the faint of heart sit this expedition out. In fact, I'm not even going to describe my voyage into the heart of darkness, but I will highlight a couple of tools that will guide you. If you open the Expert Picture Settings sub-menu, you'll find an internally generated Test Pattern, which is a great reference. But if your system includes a DVD player or an AV receiver, each component may affect your calibration. Therefore, you will need to make specific adjustments for that input by playing test patterns found on Blu-ray DVDs like WOW (World of Wonder) from Disney or the Digital Video Essentials DVD called HD Basics or the Spears & Munsil High Definition Benchmark Blu-ray DVD. To assist in calibrating to those test patterns, Toshiba provides another valuable tool that is also found in the Expert Picture Settings sub-menu called the RGB Filter. In it, you can turn off the Red, Green or Blue components of the picture. You can achieve the blue filter effect by disabling Red and Green. You can also adjust Color and Tint inside this menu. If you are real spelunker, you can tunnel into advanced tools like ColorMaster, Control Visualization and Backlight Adjustment Pro. Just be forewarned that the manual doesn't give you much guidance about using these options. Have fun and remember that the Reset tool will clean up any shenanigans that you commit. As I stated earlier, I'm quite impressed with how the 55WX800U handles 2D content. The colors are gorgeous and the picture pops. This Toshiba is an edge-lit LED LCD TV. If you have read any of my other reviews of this technology, you will know that it has a tendency to not spread the light evenly across the screen. The telltale signs are hot spots that are visible against a dark background, often along the edges of the display. I see those hot spots on this TV. As usual, they are only noticeable when the picture is very dark and are not really an issue during normal playback of a program. But they are there. As I was fine tuning the TV, I discovered that I could even out the light by turning on Auto Brightness (under Smart Sensor Settings in the Advanced Picture Settings menu). But I didn't like how it affected the picture quality. I would rather live with a rarely visible hot spot, therefore I turned Auto Brightness off. Playing the Blu-ray of Alice in Wonderland was a polychromatic pleasure. 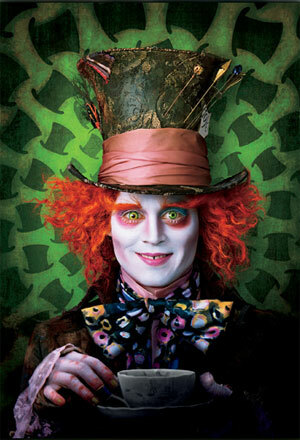 Johnny Depp's orbs were vividly viridescent and his locks luminescent orange. When I switched the TV to 3D mode and put on my 3D glasses, the image brightness dropped and the color palette was woefully desaturated. Both of these effects can be blamed on the inherent nature of active shutter 3D glasses. And any 3D TV that employs this technology suffers the same fate. My specific problem with the 55WX800U was its inability to consistently deliver a compelling 3D image. Occasionally, I would experience that "look at that" moment, but they were not as regular as I have seen with other 3D TVs. I felt that the TV and glasses were constantly straining to synch the left and right images into one 3D picture. I believe I tried everything. I sat at the recommended distance of three times the screen height. And then I moved farther back and then closer, with no success. I went into the 3D Settings option in the Quick menu and Swapped the Left and Right Image. That seemed to cure some, but not all, of the double imaging that I was seeing. But it never solved the lack of 3D punch. The bottom line is that I definitely prefer this TV's 2D picture quality over its 3D performance. As for the audio, Toshiba supplies a few useful tools. For example, I found the Cinema feature to be especially effective in delivering the sensation of surround sound through the integrated pair of 10W speakers. But really, a 55" TV deserves deep full audio that only a dedicated 5.1 or 7.1 channel system can reproduce? The 240Hz LED edge-lit Toshiba 55WX800U's picture quality when displaying 2D images is excellent. And its NetTV menu of Internet streaming partners is top notch. If only its 3D performance was as compelling. What an amazing review. Very well done - extremely detailed and informative. Thank-you very much.